The power system and components must be designed and engineered correctly. Quality equipment should be procured. The installation must meet all applicable codes and standards and be performed by qualified contractors and vendors. Verification of all of the above should be performed through an independent, third-party inspection process. All information should be documented and archived for future needs. While these are not daunting requirements, all too often these basic elements are not met when installing and commissioning an electrical power system. Poorly written specifications and contracts, lack of understanding, budget constraints, unqualified contractors, failure to utilize accredited testing and commissioning companies or a host of other reasons can lead to issues with the installation and operation of the electrical power system. Photo 1. Electrical testing can be a complicated process, requiring skilled workers and advanced test equipment. Currently, the electrical testing industry is wide and varied on both the level of service provided and the qualifications of those providing the services. Because most of the acceptance testing requirements are contract-driven by the architect/owner, the level at which the testing services are performed is quite often dictated by how well, or how poorly, the project contracts and documents are written. Typically the owner of a facility that is being constructed, such as a factory, a bank, a school, etc., specifies in the contract documents, usually in section 16.300 (CSI format), that the owner, architect, or engineer shall engage the services of an independent third party electrical testing firm. Third-party testing companies perform the necessary electrical tests and provide test reports of the test data for the installed electrical system that indicate the serviceability or non-serviceability of the equipment as determined by field tests. These field tests are different from the tests performed by independent testing laboratories such as UL for product conformance. They are also different from the manufacturer’s factory tests. It is assumed that the installing contractor utilized equipment manufactured and tested by the factory in compliance with UL, NEMA, and IEEE standards as applicable. The field tests performed by a third-party testing company verify that the equipment, after it has left the factory and after installation, has not been damaged and is correctly installed and performs as the factory and design engineer intended that it should. This data assists electrical inspection authorities in making a determination that the equipment is suitable for service. Fortunately, there exists a series of standards and certifications for the field acceptance of electrical power distribution equipment. Owners can utilize these standards to help assure themselves of the highest quality installation and acceptance testing of their electrical assets and that the technicians and engineers that perform the tasks associated with these acceptance tests are qualified to do so. The entry of technicians and business owners into the testing field is often an extension of their current job, such as electrical contractors, journeyman electricians, utility workers, ex-military or even someone working for a testing and maintenance company that does this type of work. There are also technical programs at colleges that offer specific educational tracks in electrical power skills, such as the Electrical Systems Technology program offered at Texas State Technical College in Waco, Texas. For some people, they get into the business because there is money to be made and the testing business is largely unregulated. How does this impact an electrical inspector? Two ways: 1) safety, as it’s related to the person doing the work and others around him and 2) the very real possibility of equipment damage, including total failure, fire, and loss of life that can be associated with such failures. Sounds too dramatic, right? Wrong! As an example, some years ago in the Northeast a one-man testing company arrived at the jobsite to perform testing on the protective relays associated with the facility’s power system. These were fairly simple induction-disk overcurrent and over/undervoltage relays, with a few differential relays thrown in. This particular contractor had been doing the job for several years and the staff never had an issue with his work. There were no unscheduled outages associated with the relaying, the relays looked good, and the test reports indicated all the relaying was within the manufacturer’s specifications. One day, there was a problem. An underground feeder cable failed, but the overcurrent relay protecting that circuit failed to operate. The result? The entire facility went black as the power system cascaded from one level of the system up to the next, something that should have been prevented with correct functioning of the protective relays and a valid coordination study. When the facility technical staff (with all the management in tow) investigated (you can imagine the pressure on them at this point), it was found that the original shipping packing had never been removed from the relays and this packing prevented the induction disk from turning. True story, by the way. The contractor had apparently come in each year, set up his test equipment, pulled the relays, cleaned them off, faked the testing process, put the relays back into service and went on his way. The staff at the facility did not have the expertise to determine whether the contractor was doing a good or bad job, or even what he should have been doing. The contractor declared bankruptcy, went out of business, and a few weeks later, he was back in business under a new name. He had no assets associated with the business, was protected from personal lawsuit, and basically walked away from the entire mess. The electrical industry has installation construction standards, such as the National Electrical Installation Standards, developed by the National Electrical Contractors Association (NECA). These standards cover selected electrical equipment, wiring methods, and installation standards for safety, which are contained in the National Fire Prevention Association’s National Electrical Code (NEC), ANSI/NFPA 70. ANSI/NFPA 70 codifies the installation of electrical equipment and systems within buildings. The National Electrical Installation Standards and theNECpresuppose that persons utilizing the codes have the requisite training, experience, and certification, i.e., license to perform this work. This certification and licensing is performed by other agencies, generally state or municipal government, to ensure that the practition-ers of the code maintain required criteria. Photo 2. Low-voltage fused disconnect with damaged contacts due to high resistance. A common field test is to check contact resistance with a digital low resistance ohmmeter. The NEC primarily deals with the installation of systems and their related components. How those components react to fault conditions, interact with other devices within the system, and if their overall insulation integrity and protective device operational characteristics are functioning correctly are not a primary focus of NEC-2008, nor is this common electrical knowledge. Performing these tests accurately, interpreting the results, and completing a test report so the information is clearly and accurately conveyed to the equipment owner are all areas that take years of training and experience to perform well and safely. Photo 3. 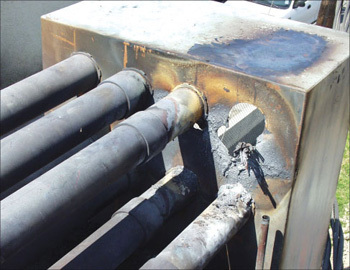 If ground-fault equipment does not function properly, the results can be substantially hazardous. With the complexity of power systems, the ever-changing technology associated with the equipment, and the speed at which projects progress (especially near start-up) how do you assure yourself of what a technician should be doing for third-party testing? (See photo 1). For example, when a technician shows up at the site to perform testing on a ground-fault system, how do you know he can do the job correctly? If he doesn’t, lives could be at stake if that ground-fault system does not function as it should (see photo 3). Currently, there is no federal requirement for electrical test technicians or their companies to be certified. Anyone could purchase a few pieces of test equipment, buy a couple of uniforms and a truck, and start an electrical testing company. A number of companies have been started in just that manner. 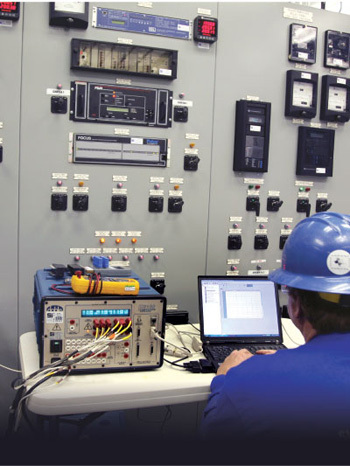 Many of these people have experience and expertise in a particular area of protective device maintenance with specific types of installed equipment or test methods, but are on a “learn-as-you-go” program for the rest of the power system. While someone may be a journeyman or master electrician, the skills and knowledge for testing and commissioning of power system components are very different from the skills and knowledge needed for installation tasks. So what about training companies that offer certification after a one- or two-week training program, or even a series of training programs? These certifications state that the person certified has attended a training class, performed a test or maintained a piece of equipment successfully (once) and passed a written test given at the trainer’s site. There is no review of job history, skill, or educational requirements; nothing from an independent, unbiased reviewer to ensure that the individuals are qualified in all aspects required for safe and accurate testing. How does one tell the good from the not-so-good, or even outright dangerous? Testing companies are often found through trial-and-error or word-of-mouth. So, where can inspectors go to find qualified electrical test technicians that have gone through an independent certification process and work for companies that have the financial and technical resources to perform the work correctly? One source that fits the bill in all respects is the InterNational Electrical Testing Association (NETA). NETA saw the need for the electrical testing industry to consider the full spectrum of criteria that should be taken into consideration when determining whether or not some one or some company is truly qualified and deemed it prudent to include minimum qualifications in the absence of other requirements. The InterNational Electrical Testing Association is an accredited standards developer for the American National Standards Institute (ANSI) and defines the standards by which electrical equipment is deemed safe and reliable. NETA certified technicians conduct the tests that ensure this equipment meets the association’s stringent specifications. NETA is the leading source of specifications, procedures, testing, and equipment performance requirements, not only for commissioning of new equipment, but also for testing the reliability, performance, and continued serviceability of existing equipment. NETA believes that specifying requisite levels of training, experience, and education for the evaluator is as important as the test procedure itself. NETA’s requirement parallels that of the National Skills Standards Board in Washington, DC, which promulgates skill levels for various occupations. NETA certifies the company as well as the individual and thus assures the end-user of the qualifications of the company as well as the overall competence of the individual technician. The Association Bylaws are designed to ensure that its members meet stringent criteria and provide a full range of testing services. NETA also requires continuing technical development for its certified technicians. The qualifications of each NETA accredited company and its technicians are reviewed on a regular basis. By definition, a NETA accredited company is a full-service, third-party, independent testing firm who must certify its technicians through uniform testing standards, maintain a calibration accuracy program, and work with a registered professional electrical engineer to review all short-circuit studies, arc-flash hazard analysis, load-flow studies, and various other reports. The firm must perform work according to strict guidelines and standards specified by the association. Photo 4. 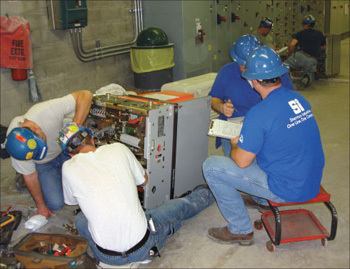 Technicians perform field adjustments to medium-voltage circuit breakers. Certification of competency is particularly important in the electrical testing industry. Inherent in the determination of the equipment’s serviceability is the prerequisite that individuals performing the tests be capable of conducting the tests in a safe manner and with complete knowledge of the hazards involved. They must also evaluate the test data and make an informed judgment on the continued serviceability, deterioration, or non-serviceability of the specific equipment. The ANSI document entitled ANSI/NETA ETT-2000, Standard for Certification of Electrical Testing Technicians, provides recognition of four levels of competency within the electrical testing industry. The four levels of certification, specifically Level III (ETT Certified Level III) and Level IV (ETT Senior Certified Level IV) provides the inspector and the owner with a definable and legitimate assurance of competency on the part of the test technician. The certified technician has broad-based knowledge — this person is trained to inspect, test, maintain, and calibrate all types of electrical equipment in all types of industries. The certified technicians meet stringent educational and experience requirements in accordance with ANSI/NETA ETT-2000 Standard for Certification of Electrical Testing Technicians. A registered professional engineer will review all engineering reports. All tests will be performed objectively, independent of the manufacturer of the equipment, according to NETA specifications and using calibrated instruments traceable to the National Institute of Science and Technology (NIST). The testing organization is a well-established, full-service electrical testing and maintenance business. Having a testing organization that meets these basic requirements is paramount if objectivity and quality are to be assured. If you want to assure the owner that his electrical assets are safe and reliable, the contracting officer should always confirm the qualifications of the testing company prior to awarding any contract. Certification requirements are placed in bid documents to protect the consumer. Nationally-recognized certification agencies and technicians with these certifications have a proven level of competency. The consumer is assured that the technician has a well-rounded knowledge of electrical testing. 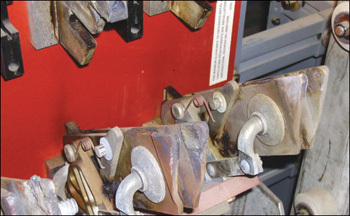 For an inspector, or an owner that likely spent millions of dollars on equipment and its installation, the easiest and most cost-effective way to assure themselves that the equipment they just turned on meets all the applicable codes and standards and will operate safely and reliably if called to is to hire accredited companies and certified testing technicians. After all, it is all about assuring safety and reliability, isn’t it? Next articleQuestions from the AHJ – To Fuse or Not to Fuse? Does UL Certify (List) Circuit Breaker Pad Locking Devices?